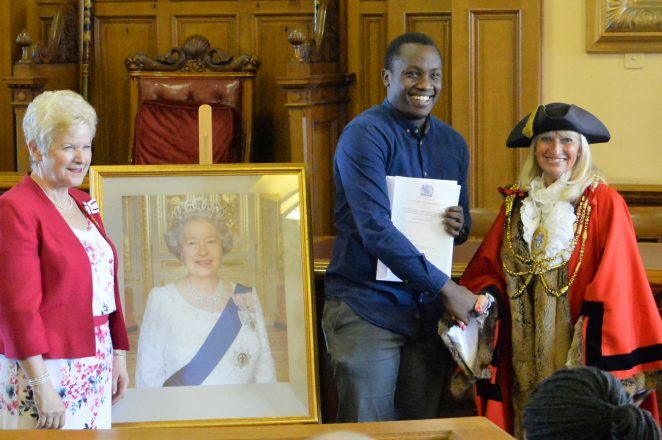 Our photograph here shows the Mayor of Brighton and Hove, Councillor Dee Simson, and Juliet Smith, Deputy Lieutenant of East Sussex, welcoming one of the group of new citizens attending the Brighton Town Hall citizenship ceremony today. Becoming a British citizen is certainly a major event in someone’s life. Applications are handled by the Home Office. The final part of the process is a celebratory ceremony where new British citizens receive their certificate of naturalisation. At the ceremony, new citizens are welcomed into the local community by local civic dignitaries and meet other people in the area who are becoming British citizens. The new citizens swear an oath and make a pledge. Pledge: “I will give my loyalty to the United Kingdom and respect its rights and freedoms. After the ceremony, everyone had tea and cakes which were prepared by the Mother’s Union.